The Nugget Pub & Grill closes Tuesday afternoon after a professor died in the facility around 2:30 p.m. 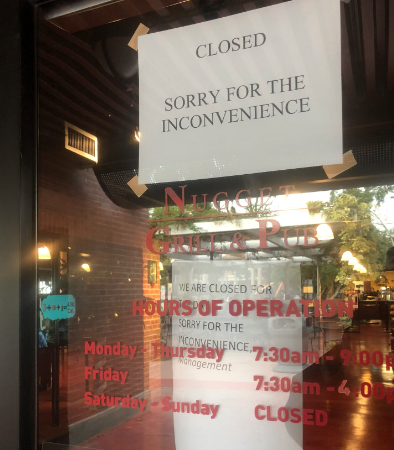 The Nugget Grill and Pub was evacuated and closed after a professor lost consciousness and died in the dining area Tuesday afternoon. Jeff Bliss, executive director of media and digital news for Long Beach State, confirmed that the professor died on the scene. Reporters from the Daily 49er visited the restaurant to investigate and saw a body covered with a sheet around 5:30 p.m. Employees and University Police officers at the Nugget would not comment. “A traumatic incident happened today, we cannot confirm or deny the actual event [but] we’ll provide further detail as we are able to release more,” said Kierstin Stickney, Director of Marketing & Communications for the 49er Shops. A student who was in the pub during the incident tweeted that the man fell out of his chair while eating. According to Bliss, Counseling and Psychological Services will offer services to students and employees who were there when the professor died.